Are you visiting India but want to escape the crowds for a while? Explore the hidden paradise of the beaches of Goa. Today’s guest post is by Seema from Panda Reviewz. She is a travel blogger who loves discovering and exploring new destinations, trying out new food and sharing her experiences with everyone who is fond of food and travel. She is also a big time Panda lover! The beautiful landscape of Goa and the pristine beaches along its beautiful coastline is a treat for every traveler in India. While most of the people are aware of the most popular beaches, there are some other unexplored beaches not many are aware of. They are often separated from the common beaches that every tourist visits. These unexplored beaches might be a bit hard to get to, but it is worth it all in the end. They are what makes Goa one of the most sought-after tourist attractions in the country. Pack a big bag of lunch and get ready to explore the places that can leave a long-lasting impression and memory in your mind. Cherish the beautiful moments of happiness with these beaches around Goa. Kakolem Beach, also often known as Tiger Beach, is one of the best private beaches in Goa. It is in a bay in the southern part of the Cabo de Rama beach, with beautiful scenic beauty surrounding it. Another point of attraction is how clean the entire area is. Since it is away from the rush of the city and people, the sand is particularly a lot cleaner. The beach is located around 31km away from Margao City, and the best way to reach and leave the beach is by renting a boat. Located just 37 km from Margao, Butterfly Beach is a place that many people are not aware of. Its sparkling crystal water is something that enthralls every visitor. Butterfly Beach is located north of the beautiful Palolem Beach, which provides it with beautiful scenery and the privacy and calmness that everyone seeks. The beach is in the midst of a forest, basically cut out from the hustle and bustle of the city. Most people often just hire a guide from Palolem Beach, but if you are looking for some adventures, you could trek your way through the forest. It often takes up to 2 hours, but the lush vegetation sure does attract the attention of the tourists. If you have heard of Olive Ridley Turtle, and their hatching and nesting season, you will have heard of Galgibaga Beach. The beach is located in a very secluded place and only has a few food shacks selling drinks and food. 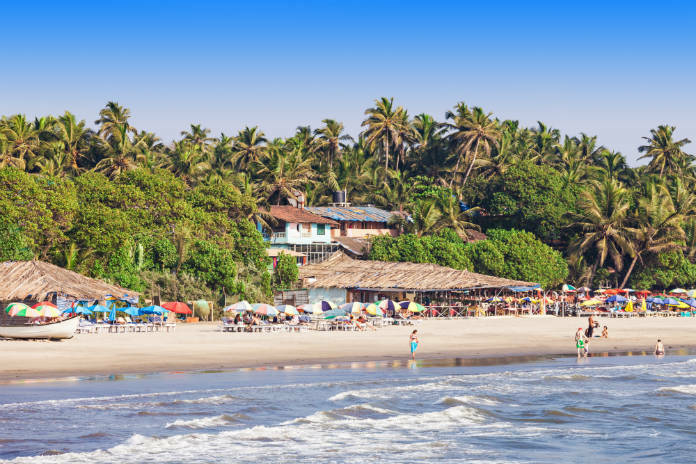 Galgibaga Beach is located 18km from the Canacona and is regarded as the cleanest beach of Goa. Its beautiful sparkling water and clean sand is something that sure does charm a lot of the visitors. Galgibaga Beach is often known as the turtle beach because of the protection act that goes around for the Olive Ridley Turtles there. Guides often say that it is best to visit this beach during December and February because that’s when the turtle eggs are visible. Betul Beach is often regarded as the fishing beach in Goa, and is located 18km away from Margao. It looks like a beautiful fishing village with the coastline and the environment surrounding it. It is a hard journey to reach the Betul Beach but is worth it in the end. You first need to come down to the Morbor beach, and then take a Cavelossim Assolna ship across the amazing Sal river to the beach. If you take an interest in fishing, then this is the beach for you. And you can also get your hands on some cheap seafood here. One of the most popular places to watch the sunrise in Goa is Hollant Beach, near to Bogmalo Beach. It is located in the southern parts of Goa and has some food shacks offering amazing food to the visitors. And the shallow waters close to the beach make it perfect for non-swimmers. There is also a chapel located close by, where the popular Feast of Three Kings is celebrated on 6th January every year. The amazing surroundings of Hollant Beach, along with the beautiful sunset, accentuate every tourist’s experience. Arambol Beach is located in the midst of a beautiful scenic view, lined with lovely cliffs. It is often a place that offers people with peace of mind and a sense of calmness. A short walk from this beach takes you to a smaller beach with a stream of the freshwater lake with thermals. It is a great place to visit visit for people who like swimming, and also has some paragliding experiences too. And Arambol Beach is the perfect place for barbeque evenings with your family. Cola Beach is another secluded and unexplored beach, located in the southern part of Goa. It is often called the Khola beach or the Little Cola beach, and is close to Agona Beach and Palolem Beach in Goa. To reach the beach, you need to visit the south of Canacona on the scenic road. You can follow the signs on the road to reach the beach. The abundance of calmness and the tranquilizing feeling that it provides are the two selling points of this place. It also has a beautiful background scattered along with coconut palm groves. The abundance of beaches is what Goa is all about. But the choice comes down to you: do you want to experience something that not many people have experienced? A place that screams tranquillity and calmness? Then, these beaches are exactly what you need to visit.